Streaming grabbed control of nearly two-thirds of music industry revenue in 2017. It’s another year of impressive financial results that proves the digital shift in listening still has not hit its peak. 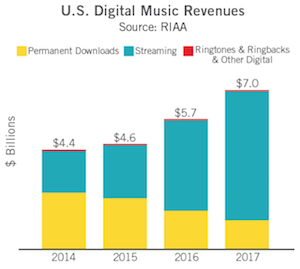 The annual report from the RIAA found that subscription streaming income helped drive the industry to another year of growth. It was the first time since 1999 that the sector saw two consecutive years of material growth. Total recorded music revenue in the United States rose 16.5% at estimated retail value to $8.7 billion. At wholesale value, growth was 12.6% to reach $5.9 billion. Streaming secured a 65% share of the music industry revenue in 2017. 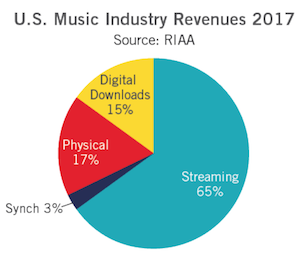 Physical revenue had a 17% share, while digital downloads were responsible for 15%. Streaming revenue totaled $5.7 billion for the year. Growth for this segment has been explosive in recent years, up 43% from the $4 billion made in 2016. In 2015, streaming revenue was $2.3 billion and it was just $1.8 billion in 2014. Subscriptions continue to drive much of the streaming growth, posting a 63% increase in revenue year-on-year. Streaming subscription revenue in 2017 exceeded $4 billion for the first time. At 47% market share, it is the biggest format for music consumption in the U.S. 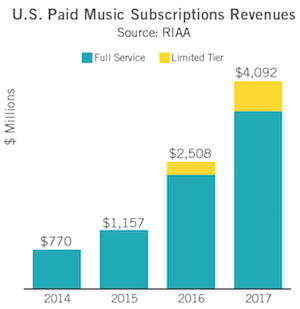 The RIAA started tracking limited tier subscriptions last year, which it defines as paid music services that have some type of restrictions on amount of access. It includes Pandora Plus and Amazon Prime. This category drove 14% of the subscription streaming revenue in 2017, up from 11% the previous year. More listeners are signing on for full on-demand subscriptions, which is also helping to boost the financial performance for streaming. The RIAA report found 56% growth in subscriptions to reach an average of 35.3 million during the year. Limited tier subscriptions are not included in that metric. Ad-supported streaming remains a smaller share of the digital music revenue compared with subscriptions, but the field did also see growth. Revenue from this segment increased 35% over the year to $659 million. The other portion of digital revenue is downloads, which continued to take a nose dive. Digital download revenue dropped 25% to $1.3 billion. Single tracks and full albums were equally hit by the decline. This year marked the first time since 2011 that download revenue was topped by sales of physical formats. Physical product sales did also post a drop, but it was only down 4% to $1.5 billion. CD shipments dropped 6% to $1.1 billion. Vinyl sales continue to be a small but bright spot in the physical segment; vinyl sales rose 10% and contributed $395 million in revenue. More listeners are signing on for full on-demand subscriptions!